Wow! Lesley, Karl, Ann, Lauren & I are all so grateful for the brave and vulnerable nominations that came in for our first A Matter of Kindness Day! Every single person who entered deserves this day of kindness. We had a REALLY tough decision with 24 entries. Honestly, we wish we had the space to give this special day to each of them; they are all so deserving. Congratulations – we’re so excited to share this day of kindness with you! Showing yourself some kindness has a ripple effect in the rest of your world. It spreads into your household with your family & pets, then out into the community and into the world. We have the power to give and receive kindness everyday! Let’s exercise that power! How will you show kindness to yourself or others today? 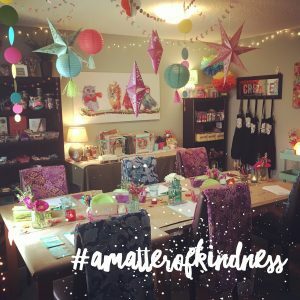 Keep your eyes open this FALL when nominations open for our next A Matter of Kindness day!